The Disneyland rope drop may be one of its least-known and most enjoyable of all Disneyland experiences. Why do I say that? Well... I've yet to encounter much of a crowd when I did it. And all but a couple of my most Disney-fanatic friends had never heard about it until I told them. It's so magical, it is listed on our Disneyland bucket list. That may be in part because it's not a scheduled event. And you have to get to the gate early to see whether it will happen or not. When it does, guests can enter the Disneyland gates half an hour before the posted opening time. The excitement starts before the gates open when everyone is coached to shout together: "Let the Magic Begin!" And then people start pouring in. A quick walk down Main Street U.S.A. will take you to the ropes. They stretch across all the entrances around the hub and keep you from going further. At opening time, you'll hear a welcoming message, and you can join all the other excited guests who rush in. That is if you aren't wiping tears from your eyes because it's all so magical. Your best bet is the middle line that goes toward the castle. From there, you can go straight to Peter Pan and get on with the shortest wait time of the day. Mice Chat also has a few tips for the rope drop. You might know that Disneyland gives out birthday buttons. You might even know that Cast Members say happy birthday all day when you wear one. Other guests may join in, too. I've even seen a whole line of people at Space Mountain singing to a total stranger. What you may not know is that you can celebrate your birthday any day of the year, not just on its official date. Or several times a year if you want. Just tell the Cast Member at City Hall that you're celebrating your birthday, and you'll get a button - no proof necessary. The ice cream nachos in the photo are just one of the things you can order off-menu. They were a Halloween special treat that - like the ghosts in the Haunted Mansion - just won't go away. They aren't on the posted menu at the Golden Horseshoe, but all you have to do is ask. Carthay Circle in California Adventure has an off-menu dish just for vegetarians called the Vegetable Tower. I have also heard rumors about an off-menu cherry milkshake at Carnation Cafe and ordering the Blue Bayou's Monte Cristo sandwich for dinner, even though it's usually a lunch item. When there's a new ride or attraction at Disneyland, there’s usually a Grand Opening. It has an official date. You might think you won't have a chance of getting on it before then. Here’s the little insider secret: They often run the ride off and on for a week or two before that Grand Opening, to make sure everything is working. It's called a "soft" opening. Days and times won’t be announced ahead of time, but if you are in the park during that time period, keep an eye on the new attraction and listen to your fellow visitors to see if they're talking about it. You might experience a few last-minute glitches when you're one of the first riders. But you can get bragging rights if you manage to be there at the right time. If you want to know what's new at Disneyland this year (and for the past few years), check out What's New at Disneyland This Year. It sounds like something you might see at a rodeo, but in fact, anyone can do this trick when they ride Big Thunder Mountain Railroad. There's a technical explanation for why doing the Goat Trick makes you ​feel like you're in swirling water going down a drain. It's all about G-forces and your inner ear, but you probably don't care about that, so I'll get down to the details. Sit in the back row of the last car, for maximum effect. You can manage that by just telling the cast member what you want to do. Just after you get pulled up a hill for the second time, you will see a goat standing on a rock, holding a stick of dynamite in its mouth. Fix your eyes on it and turn your head to keep looking at it as long as you can. Don't blame me if that dizzy, down-the-drain feeling makes you a little queasy. If you see a Disneyland Cast Member wearing a lanyard full of cute trading pins, you can trade with them for anything they have. That's right - you can swap that very ordinary Mickey Mouse pin for something fun and unusual. They often carry pins you can't get in the stores and the experience makes the pin an even more fun memory of your visit. Pin trading etiquette says that you shouldn't touch someone else's lanyard. Instead, ask them to show you something more closely if it's needed. You need a qualifying pin to trade. The requirements are listed online - but pretty much any pin you buy at Disneyland will do. According to people I've talked to about the Disneyland Baby Care Center, their kid-sized toilets are the highlight of some little ones' entire Disneyland day. They're exclusively for folks under 42 inches tall. And way more fun than dealing with the kids in the adult facility. At the Baby Care Center, you can also have a cool, quiet place to change a diaper, give a bottle, or nurse. They even have a kitchen with a sink and microwave oven. At Disneyland, the Baby Care Center is next to First Aid just off Main Street USA near the corn dog cart. In California Adventure, it's at Paradise Pier near the Boudin bakery. You may not expect Disneyland to be the kind of place where you can get an "adult" beverage, and that's true in the Disneyland Park. Over in California Adventure, it's a different situation. In fact, you can get a cocktail at Carthay Circle Bar or the Cove Bar next to Ariel's Grotto. You can also enjoy alcoholic refreshments, including beer and wine at several other places in the park. Check the park map for the latest list. Few visitors notice the two old-fashioned-looking telephones just inside the front door of the Starbucks on Main Street U.S.A. Even fewer pick up the handset. But of course, you know better. Those old phones are like a little time portal into a bygone time when several households shared the same telephone line - a "party" line. And the gossip those women are sharing is hilarious! 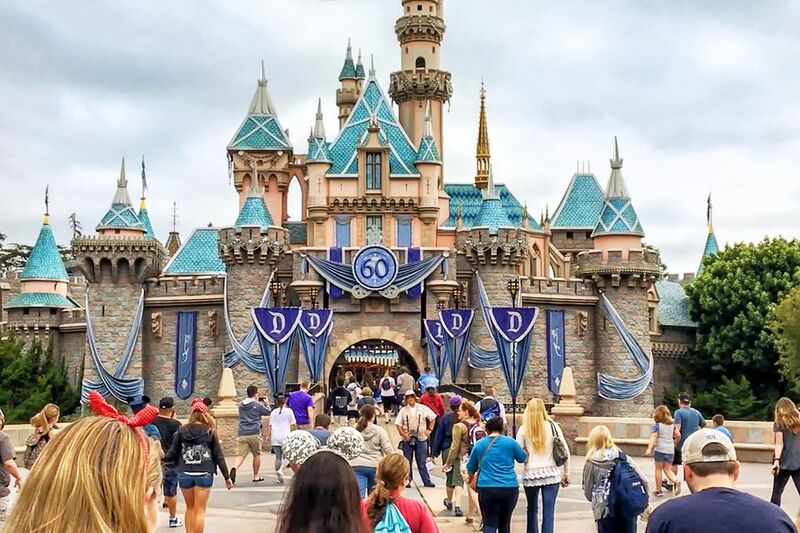 Tickets to Disneyland cost so much that you might think everything else will drain your pocketbook, too. Actually, you can get quite a few things for free - if you know where to go and how to ask for them.